President Jack first welcomed our four guests. 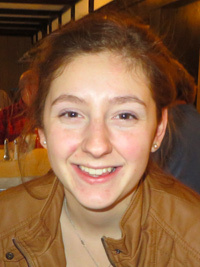 He then announced that Key Club Vice President Emilie Maddocks reported on an upcoming event this weekend and volunteer help is needed from the Kiwanis Club. On Saturday, from 12-2, there will be a celebration of the life of the late Lily Johnson who was killed last April. The event will take place at the boat ramp on Messer Street on the east side of the bridge. Volunteers are asked to meet at the Middle School at 10:30 and then walk to the event staging area to help with set-up. If you can bring baked goods that would be appreciated as well. Anyone with questions may contact Key Club Co-Advisor Chris Ulrich at 603-856-3284. Jack reported on two additional dates to remember: May 17th for the bicycle rodeo/safety day and HR Derby, which is tentatively set for June 8th. 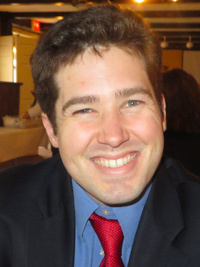 Brian Winslow took the floor to inform the club that at our next meeting, April 28th, the new slate of officers and directors will be presented and, if approved, voted on at the Annual Meeting May 12th. While having the floor, Brian also announced our “gaming” take from the Loudon track was a net of just over $6,200. He also noted he will again be chairing Bike Week water sales on the boardwalk again this year. 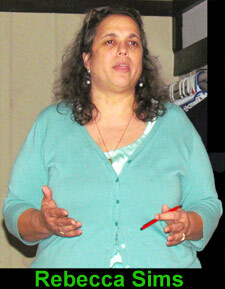 Meredith Horton updated the club as to the planning for the Bicycle Rodeo/Safety Day. The Marine Patrol, Laconia Fire Department and Laconia Police Department will be represented as well as LRGHealthcare and maybe even Smoky the Bear. 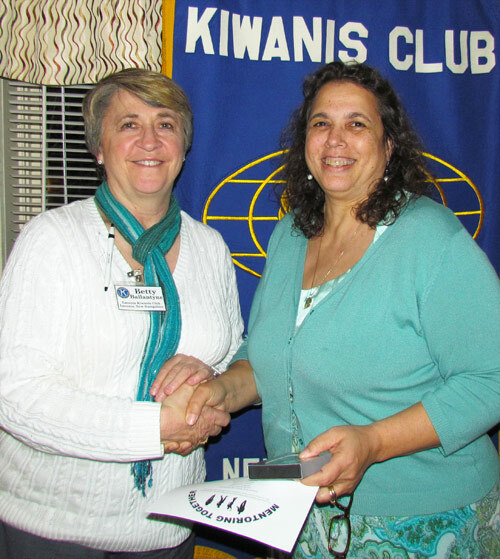 Kathy Calvin reported the next Kiwanis KARES is scheduled for Monday, April 28th at Elm Street School from 9:30 to 10:30. Also, the Kiwanis Club recently donated $50 to Literacy Day at Woodland Heights School for the purchase of books for that event. 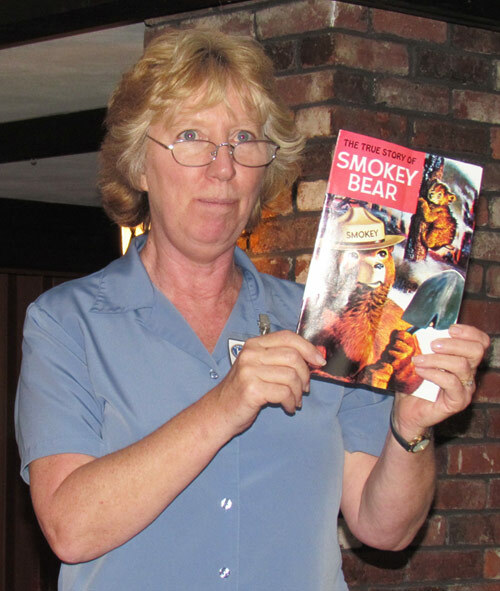 Kathy was thrilled that one of those books, The True Story of Smokey the Bear was the same book she grew up with in the 1960’s. 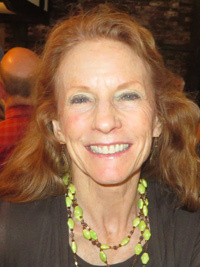 Kathy Calvin shows off one of her childhood books. $62 was collected. Roger Webster won the free meal. 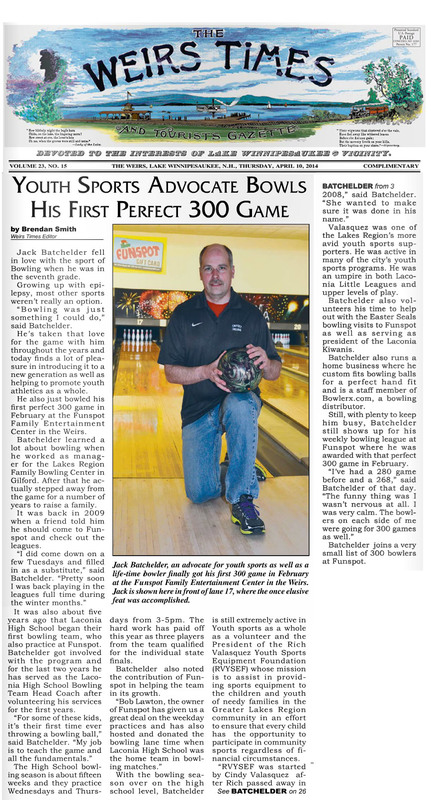 $3 from Jack Batchelder: $1 for Roger Webster mentioning the article in The Weirs Times about him bowling a perfect game (See story at the bottom of this page), $1 for Scott Laurent filling in for him at the last meeting, and $1 for Scott filling in for him at the next meeting while he gets a chance to go watch his daughter, Samantha, play ball in Kansas. After careful deliberation, Sgt.-At- Arms Phil Bonafide chose to waive the fine that Kevin Irish deserved for a late arrival. Upon further review, he realized that Kevin was merely standing outside the entry door until we finished murdering “God Bless America.” Don, we sure do miss you! Betty Ballantyne introduced our guest speaker, Rebecca Sims. 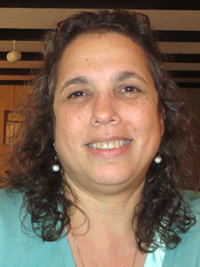 Rebecca is an educator at Laconia Middle School where she is presently the Mentoring Coordinator of the Mentoring Together program, which is now in its third year. The Mentoring Together program was born out of Better Together, and provides the “community” a piece to the school-family-community dynamic. Rebecca described the program overall, described what the middle school kids are dealing with at this stage of their lives, and talked of how rewarding this program is not only for the kids but the mentors as well. Rebecca reported that over 56% of the children in the five Laconia public schools qualify for free and reduced price lunches and that many of these children come from homes with either no parents, one parent, or two parents working. This results in children have many hours of being alone. All this comes at a time of significant physical and emotional change. In the Q&A following the program, the Club learned that the Mentoring Together program entails just one hour per week during school. There are no holiday weeks, no summer months, and no cost to the mentors other than their time. This includes: active listening time, role model time, but not fix-it time. Rebecca noted many children involved in this program are stuck in generational poverty and 70% of them will never escape it. Mentors have an opportunity to change a child’s life. Anyone interested in becoming a Mentor can contact Rebecca at her email address: rsims@laconiaschools.org. A training hour will then be scheduled followed by a meeting with the SAU HR Director and an application and fingerprinting. A background check is done on all mentors just like any school employee. For more information on the Mentoring Together program, “click” here. Betty Ballantyne congratulates Rebecca Sims for her presentation. 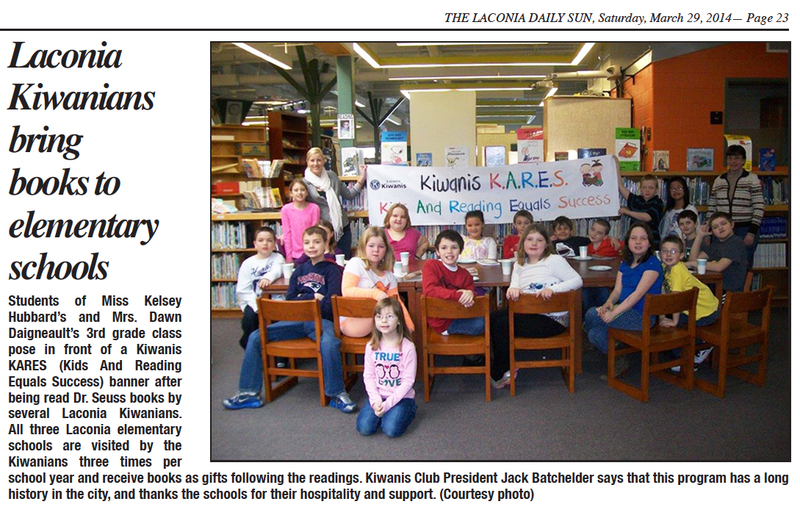 Tonight's meeting was adjourned at 7:52 p.m.
Kiwanis K.A.R.E.S was featured in the 3/29/14 edition of The Laconia Daily Sun. To read that story, "click" here.